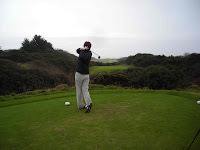 Christmas and New Year were a disaster for golf in Ireland. The rain of November was followed by freezing temperatures – I should know, I locked myself out of the house on Dec 23rd in -4 degrees – which led to snow and then rain. Muskerry, a course in Co. Cork, was closed for 32 consecutive days, which is no surprise after the horrendous flooding the Cork region endured. The picture wasn’t much brighter elsewhere, but then came a beam of sunshine. In fairness, it came from the one place you can always rely on: The European Club. Pat Ruddy just has a way with things and he knows how, and when, to use his nous. With so many clubs shut, and the European in such good condition – and let’s not forget all those golfers who were champing at the bit to get out and play – he promoted a rate of €40 a round for a week (12-19 January). 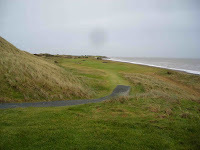 It was snapped up, and I was lucky enough to get a fourball booked for 11.30 on the Saturday. 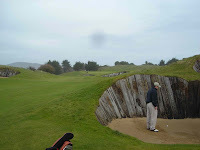 I hadn’t intended on playing at all, but my pal Finbarr was back from the US for a couple of days and had emailed me to ask if a round would be possible. Friday night was unbelievably wet and on Saturday morning as I drove over the bridge on the N11 at Arklow, the Avoca River was higher than I’d ever seen it. It flows through the centre of Arklow and the 19 arch bridge that divides the town was deemed too dangerous to cross. Surely the European, a few miles to the north would be closed. Not at all, and apart from a few damp fairways and the odd pool of casual water, you’d hardly know there had been such a downpour only hours before. If you’ve read my book, you know that I adore The European. This day was no different. Bright sunshine, friendly staff (which is a bit of a misnomer, since it was Pat Ruddy himself, and his son Ger who were managing the day) and plenty of time to have breakfast and a chat. And then more time to get irritated with my playing partners who turned up late, so we missed the tee time and got bumped to the back of the queue. Am I going to make some sarcastic comment about Finbarr’s brothers-in –law, Stephen and Dave, never being able to get out of bed to make a tee time? I wouldn’t dream of it. Actually, it was just as well we got bumped, because we quickly lost ground on the people ahead of us, and it took us five hours to finish. Lots of lost golf balls (the rough may look short but you’re never going to find a ball in it) and lots of found golf balls (but only if you step on them) kept it slow, and there were few holes when at least one provisional drive wasn’t hit. Not that it mattered, it was a lot of fun. The European is, after all, one of the best courses in this country, packed with variety, intrigue and challenge. The four of us agreed on a Skins format. It’s one of the more entertaining set-ups. I played skins several years ago with two friends; two of us halved the first 12 holes, while the third wandered aimlessly as he tried to find lost balls galore. On the 13th hole he hit two lucky shots and sank a putt to win 13 skins. Our match wasn’t quite as one sided, although Steve failed to register one skin much to Fin’s obvious delight. They’re a competitive bunch, and Steve and Dave were distinctly unimpressed when I gave Finbarr a putt that resulted in three skins on the 11th. The 12th boasts the longest green in Europe, at 120 something yards. I’ve never seen the pin anywhere but the front, but here’s a word to the wise: the fairway distance markers are to the centre of the green. So standing by the 150 yard stake actually leaves you with only 90 yards to the front. Dave didn’t believe me, and from just inside the 200 yard stake he hit a four iron. It sailed over the pin and up the green. It left him with a fifty yard putt and despite hitting it as hard as he could, he was still short. You should find a long green of that length sometime and try to putt from one end to the other. It’s a lot harder than you’d think. 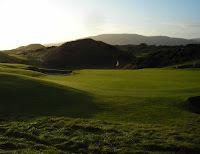 We almost finished in the dark but we enjoyed the course – as always – and all the lads from Ireland’s main golf forum on www.boards.ie enjoyed it too – the promotion got a great plug early on and at least a dozen groups booked straight away. At the end of the round, Pat Ruddy showed me around his new library – which contains 5,000 golf books. So far. He plans to increase that to over 10,000, and hopefully match the US PGA’s collection of 15,000. No small ambition there. But then again, this is the man who designed and built The European himself, and never seems to be happy unless he’s out in a digger moving something somewhere.